Ferry to the Catalina Island sail from Catalina Express Terminal Long Beach in downtown. 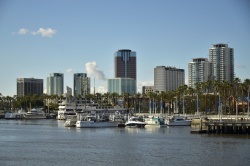 During the summer season, Long Beach Transit's AquaLink and AquaBus water taxis stop at various locations in the downtown waterfront. Long Beach Transit provides local transit service in the area. Long Beach Transit Gallery on 1st Street is the main transit center in the area. Santa Fe - South St. This page was last edited on 4 September 2018, at 14:59.